The FXTT Trendline EA for MT4 is a robot that helps you trade using the trendlines drawn on your chart. It basically allows you to set pending orders using trend lines. Something that Metatrader does not allow you to do by default. Magic Number - The magic number for all the opened orders. Maximum Slippage (in pips) - The maximum slippage allowed (in pips) for the open orders. Minimum line distance (in pips) - The minimum distance (in pips) that price must be from the line to be considered as a touch. Default Stop Loss (in pips) - The default value to use as a Stop Loss if none is defined on the trendline. Default Take Profit (in pips) - The default value to use as a Take Profit if none is defined on the trendline. UseMoneyManagement - If true, the default lot size will be calculated according to the parameter Risk Percent. Risk Percent (MAX.10%) - The default volume is calculated according to a risk percent of the account balance (If no volume command is present on the trendline). Default Lot Size - The default volume to use (if no volume command is present on the trendline). On close of candle – the order will only be opened after the candle closes after breaking the trendline. On distance in pips – the order will be opened as soon as price breaks the trendlines by the number of pips defined in “Breakout distance in pips“. Breakout distance in pips – Only if the "On distance in pips" option is active, this parameter allows you to define the distance in pips from the trendline for which the EA will consider a breakout. This EA is a tool that assists in your trading. It does not work without user intervention. Using a robot carries risk. You should test it on a demo account FIRST to understand how it works. Sell 0.05 lots on touch of trendline with stop loss of 20 pips and take profit of 50 pips. Amazing EA for the price! There are some things that could be improved upon or added, but at this price, you can't complain! Highly recommended. Don't bother with the demo version, support the developer and fork out the $30. He responds very quickly to questions and fixes bugs in a timely manner. ***EDIT/UPDATE June 14, 2018***: After using it for a while, I have encountered a few bugs, which have unfortunately caused me to lose money. I can't rely on this EA at the moment, so I cannot recommend it in its current state. - Added feature to allow multiple actions per line. - Added "ReentryType" option that allows multiple entries per line. 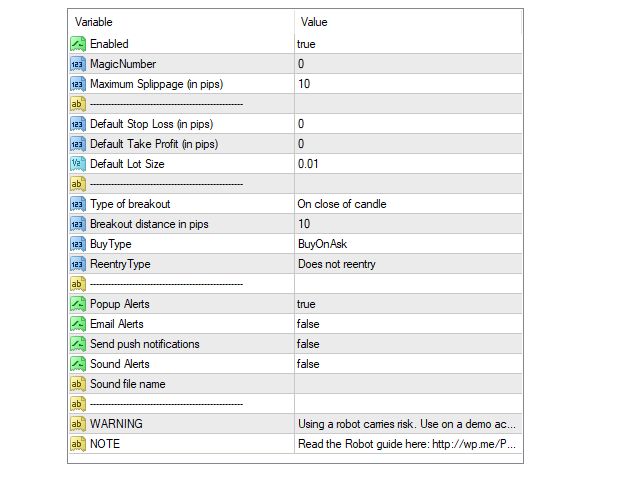 - Added "BuyType" option to choose the detection of BUY actions (on ASK or on BID).